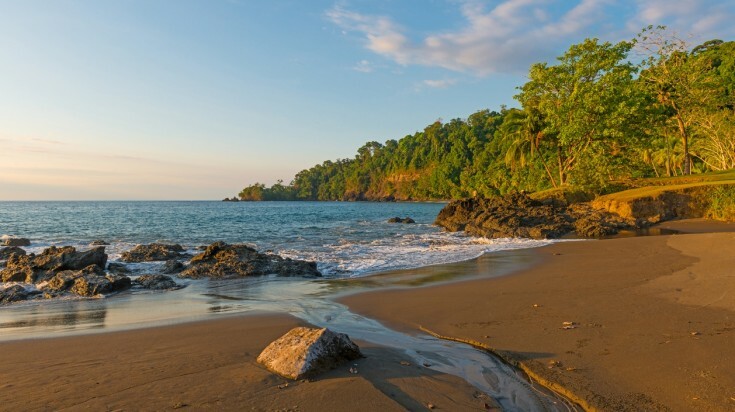 Small in size but huge in attractions, Costa Rica is an ideal tropical getaway. This Central American nation boasts palm-fringed, paradise-like beaches on two different coasts, rivers that just beg to be rafted, primary rainforest packed with an estimated half a million species and smoking active volcanoes. With a quarter of the country legally protected, the ‘Rich Coast’ is aptly named, whether you’re a beach bum or adrenaline junkie, and whether you have just a few days or a couple of weeks to spare. So if you’re planning a trip to Costa Rica, read on to discover our favorite itineraries in Costa Rica. 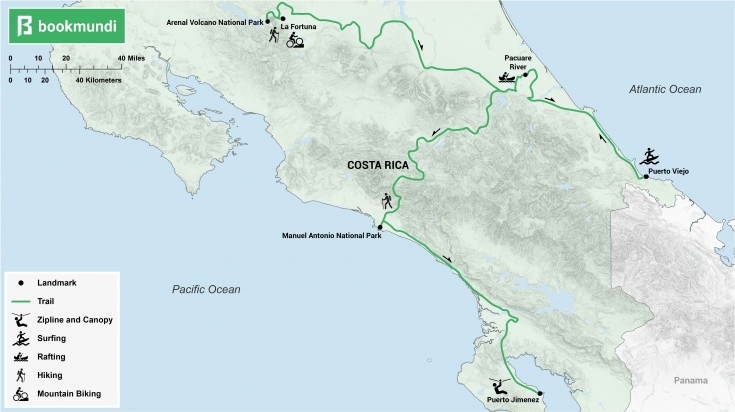 Costa Rica lays claim to almost 1,300 km of coast, divided between Pacific Ocean to the west and Caribbean Sea to the east. 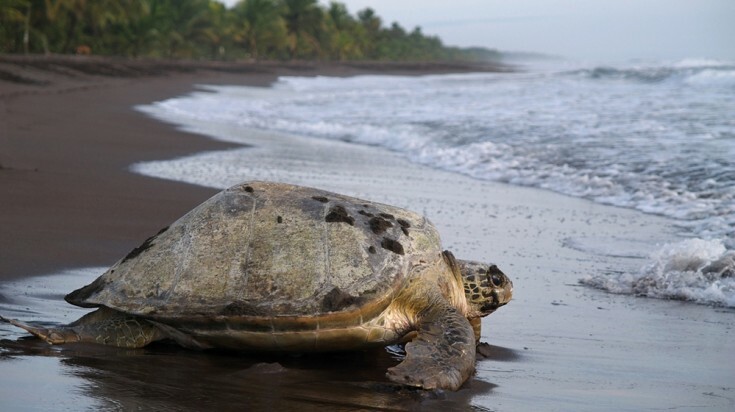 To see the best of the country’s stunning coastline, start at Tortuguero National Park on the Caribbean coast, a region of waterways and hiking trails famed for nesting green turtles between July and October. Stop at Bajos del Toro waterfall, the highest in the country at 90 m high, before continuing to Arenal Volcano National Park. 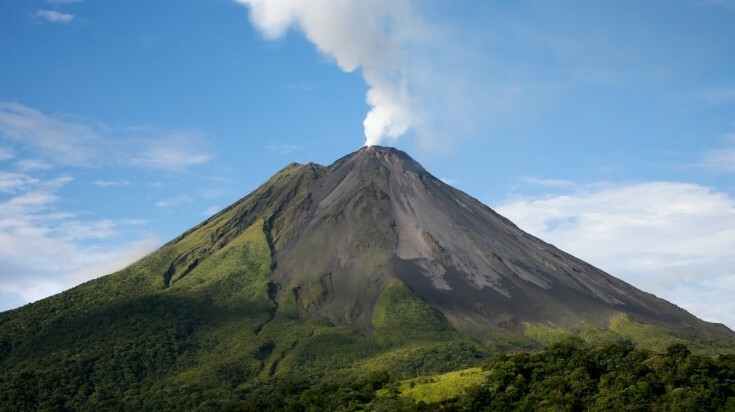 The cone-shaped Arenal last erupted in 1968, but the region is still active and home to several hot springs, including those at the Ecotermales spa in La Fortuna. 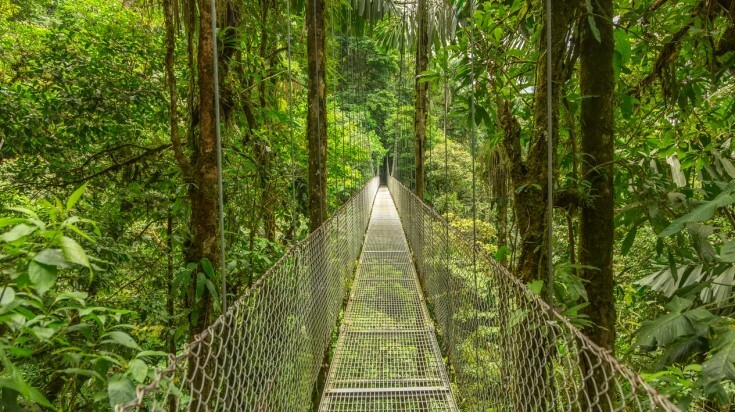 Next, pass through the virgin jungle of the Monteverde Cloud Forest Reserve on your way to Rincon de la Vieja volcano within the national park of the same name. Visitors who make it to this rarely visited hidden gem can bathe sore feet in hot springs while listening to the sound of howler monkeys and the 257 species of bird that call the park home. 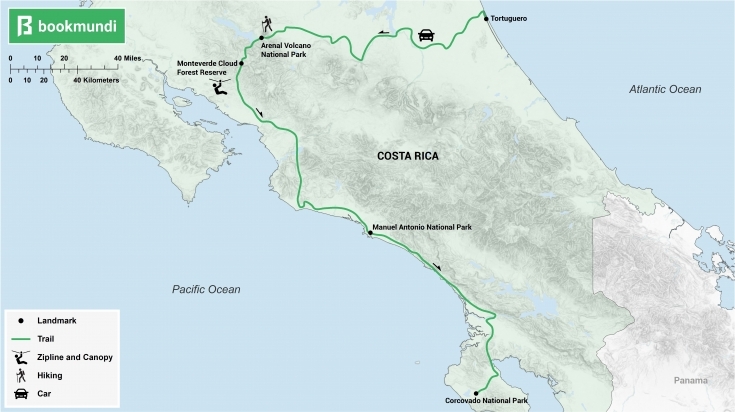 Alternatively, head to Corcovado National Park on Osa Peninsula. 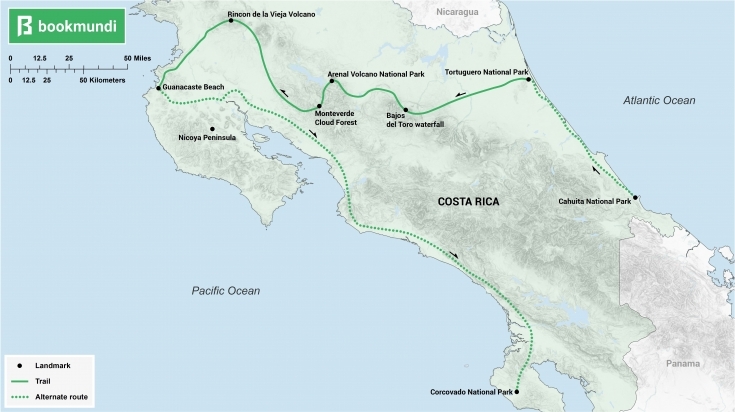 Though secluded, Costa Rica’s largest area of protected land is also the world’s most biologically intense. Finally, return to the beaches, either in Guanacaste province and the Nicoya Peninsula, where the Pacific waters are warm and calm enough for swimming and snorkeling, or at Cahuita National Park back on the Caribbean Sea. Few destinations offer quite so many adrenaline-inducing activities in such close proximity to one another as Costa Rica. Using the town of La Fortuna as your starting point, explore the wonders of Arenal Volcano National Park. 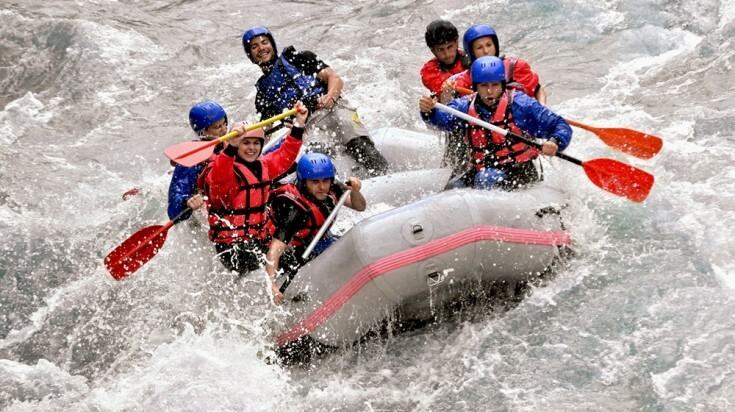 Take to the park’s many hiking and mountain biking trails, and enjoy world class white water rafting on the Pacuare River, on which it’s possible to kayak all the way to the surfing beaches of Puerto Viejo on the Caribbean coast. On the Pacific coast, hike through Manuel Antonio National Park, home to iguanas and White-headed Capuchin monkeys, which come right down to the white sands. 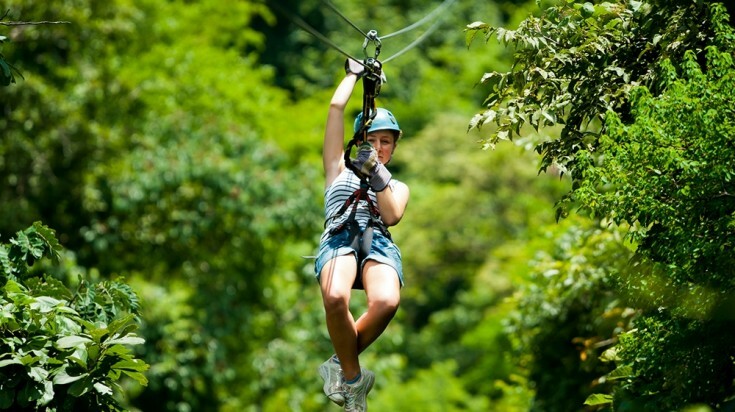 Then end your adventure-fueled tour at the ziplines and canopy tours of Puerto Jimenez. 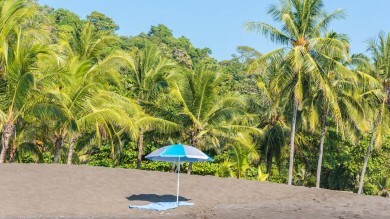 Looking for a family holiday and unsure where to vacation in Costa Rica? 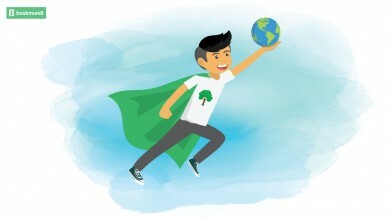 The country has led the world in protecting its astounding biodiversity, protecting a quarter of its landmass from development. 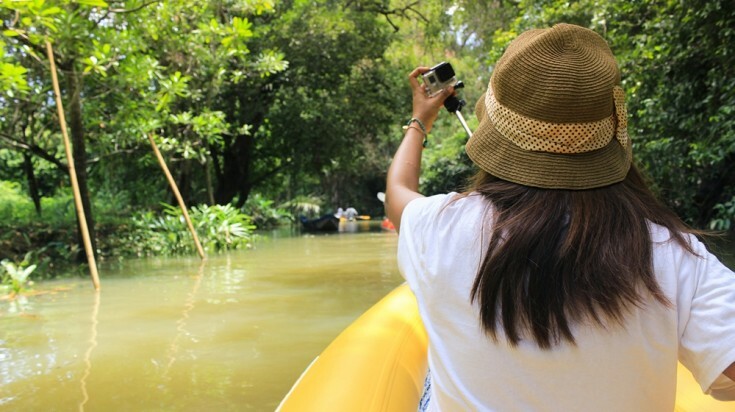 As a result, it’s a great destination for both families and lovers of the natural world. Begin at Tortuguero on the Caribbean coast, home to nesting green turtles, manatees and crocodiles. 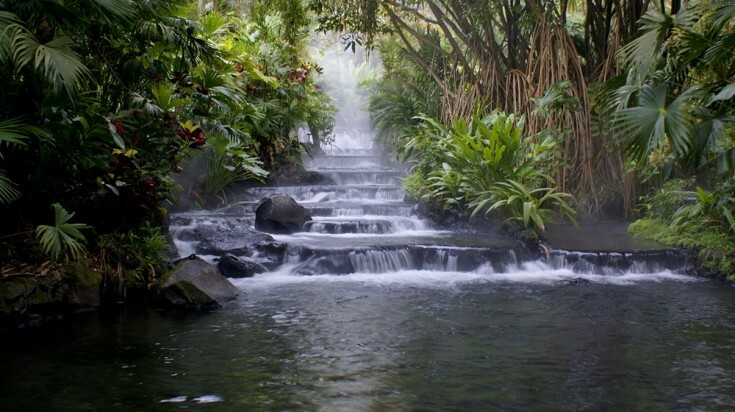 Then travel to La Fortuna, gateway to the nature walks within the jungle of Arenal Volcano National Park. 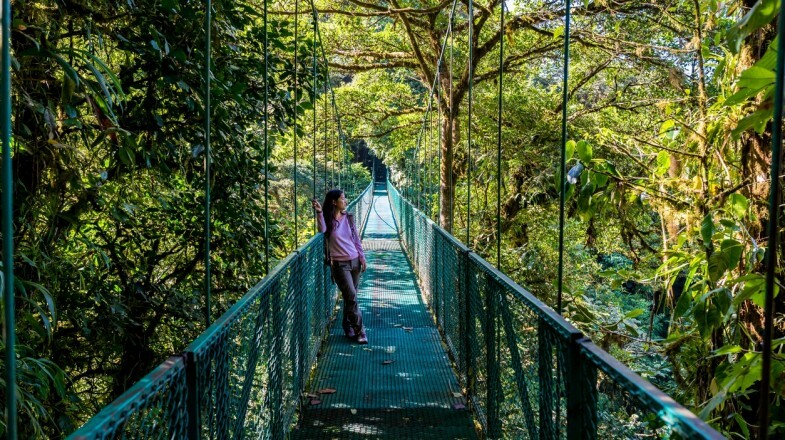 Continue the theme amid the habitats of Monteverde Cloud Forest Reserve, where you can zipline through the canopy, get into the saddle, and visit a butterfly garden. 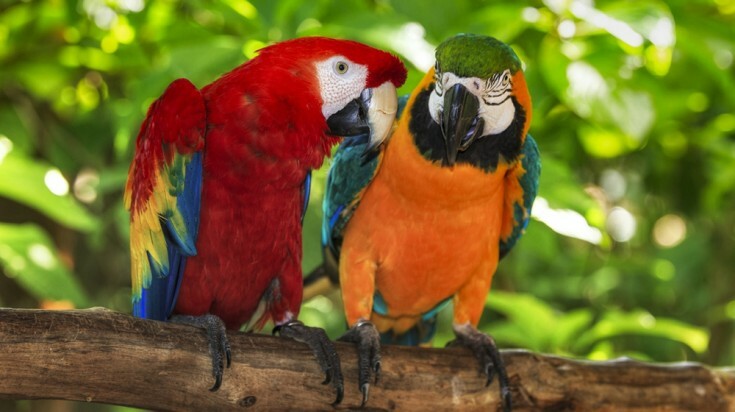 Alternatively uncover the more-than-350-bird and animal species that reside in the coastal rainforest of Manuel Antonio National Park, before ending your explorations in Corcovado National Park, considered one of the world’s biodiversity hotspots. You can also soak into one of many hot springs heated by the volcano just outside the national park. 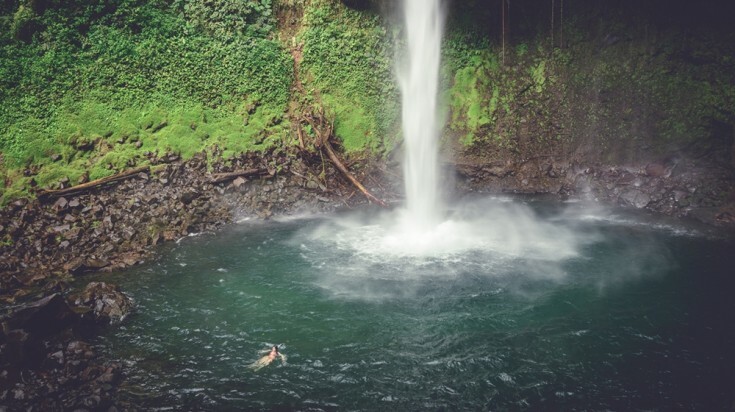 Swim in the natural pools of La Fortuna waterfall. If you’re short of time, you can still see the best of what Costa Rica has to offer by concentrating on the area around Arenal Volcano National Park in the north of the country. From a base in the small town of La Fortuna you’ll be able to take in the region’s fruit plantations like coffee and chocolate; and cattle ranches as well as incredible views of Arenal Volcano itself from a viewpoint 30 minutes’ walk away. 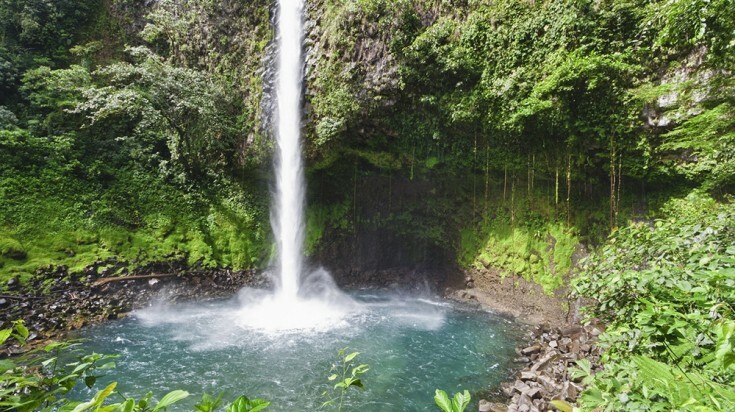 Visit La Fortuna waterfall on the way to Arenal Volcano National Park. 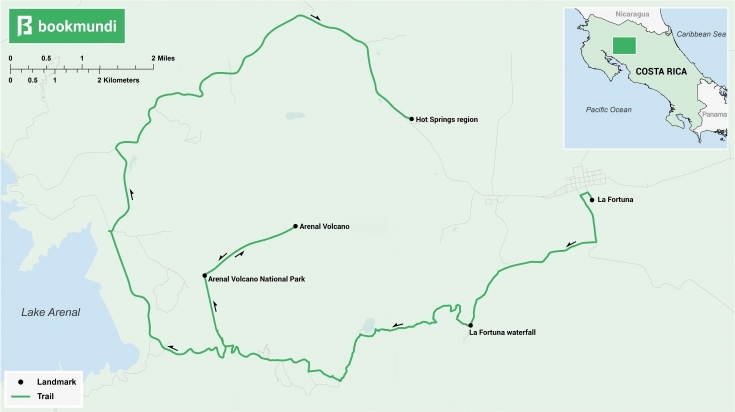 Then, explore the national park further while keeping an eye out for howler monkeys, jaguars and colorful tree frogs. 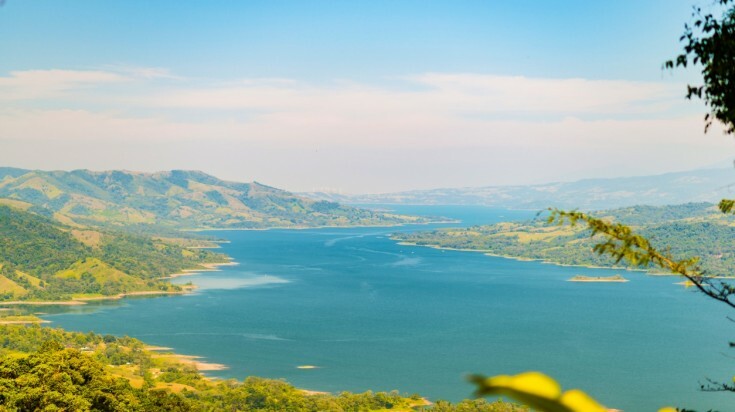 Afterwards, head to Lake Arenal, the country’s largest lake, and the hub of the country’s watersports industry. 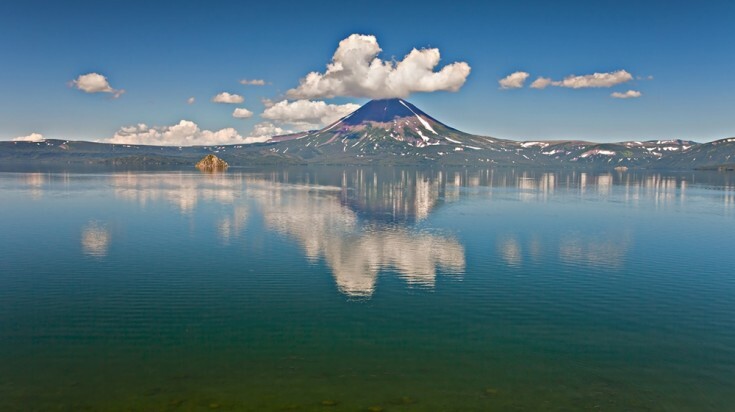 Still geothermally active, the area is also dotted with hot springs, which alter between mere holes in the ground to spas offering world-class massage therapies. Costa Rica has an astonishing array of diverse attractions. From tropical primary rainforests brimming with adventure to 1,300 km of coastline which takes in both the Caribbean and the Pacific. 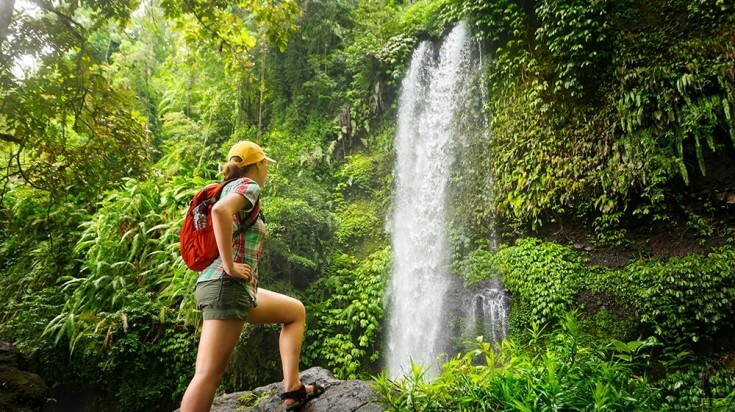 Nature lovers, families, adrenaline junkies and solo travellers will all adore this Central American paradise and indeed there is something for every type of traveller. Travelling to Costa Rica? Chat with a local travel specialist in Costa Rica who can help organize your trip.